The music this album contains causes as much of a sense of overload as the cover art, with its perpendicular textual tessellations. Chessex has long pushed the tenor sax beyond the realms of conventional jazz or even overt compositional forms, and Subjectivation, a collection of live actions (a term also used by the notorious noisemakers Whitehouse). 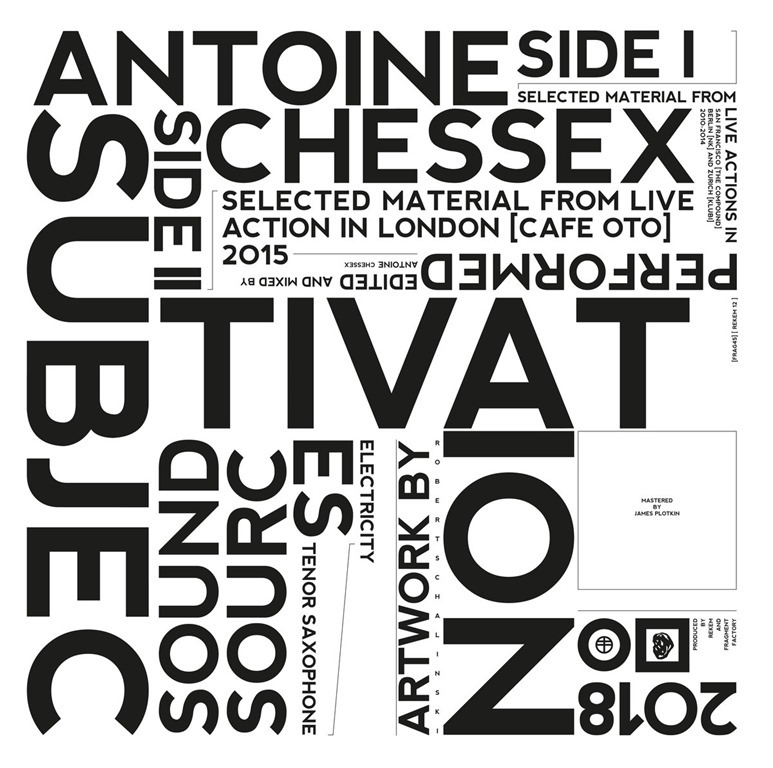 Side 1 takes pieces recorded in San Francisco, Berlin, and Zurich between 2010 and 2014, while Side 2 documents a performance at London’s Café Oto in 2015. It’s all about the low frequencies at the front-end: the album begins with earth-moving, bowel churning bass tones that grind and snarl maliciously, and this, coupled with the conveyance of extreme volume places this in Sunn O))) territory, the atmosphere of creeping doom delivered at a pace and volume that punish slowly. And gradually – although not nearly so gradually – things intensify as additional layers of volume and frequency are added. The accompanying text describes it as a ‘field of distortion’, but it doesn’t come close. It seems unfeasible that such a raging sonic force could be sustained for any time, let alone increase, but increase it does, until there is nothing but a dense wall of obliterative noise. It’s impossible to discern there being any saxophone – or indeed any music instrument – in this vast, screaming whorl. I’m staring at the speakers in awe, wondering just how much sound they can actually carry, and moreover, how much sound could be created in pure physical terms. Seven minutes into the fourteen-minute sonic barrage – something akin to standing next to an RAF Vulcan preparing for take-off without earplugs or protective clothing, I’m wondering if my skull might not implode and my brain before the end. It’s a perverse pleasure the pain of this sonic assault provides. The London side is less full-on, although it would surely be difficult to be more full-on. Nevertheless, it matches Side 1 in terms of intensity. It builds quickly from an irritated hornet buzz into an infinite echo, a thousand horns, honking in unison to create a rippling reverberation of sound. Some time around themed-point, the sustained crescendo fades, leaving eardrum-fluttering feedback notes, shrilly quivering on and on, before the air is rent with shards of scraping industrial noise, the grinding of metal on metal on a fast, rotational plane. It’s as if with each shift, Chessex introduces a pitch and tone more unbearable than the one before. The tiny sound that hangs where there should be silence mimics tinnitus, creating one final torture in the album’s closing seconds. There’s something cruel – and unquestionably uncompromising – about the way Chessex executes his sonic blitzkriegs, and for that, I admire him enormously.